Each pot made by artist Anne Sullivan is made individually, as a one-of-a-kind piece of art. Each whimsical piece has a lot of personality. 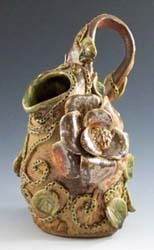 Anne loves to use wheel-throwing, as well as hand-building techniques and textures to create unique teapots as well as other pieces of pottery that bring her joy with their form and decoration. All of the pieces are made with stoneware, which is very sturdy, long-lasting, and is food-safe, dishwasher-safe, microwave-safe, and oven-safe. Unless otherwise stated, all glazes used are completely foodsafe and lead-free. If you have an idea of something similar you would like to see custom-made, please contact Anne, she is always open to new ideas! This piece was born from a round robin project with two fellow potters Angela Michalski and Diane Simmons. We each created a form and passed it to the next person to add on to in any way we wanted, then it was handed on again. The third person finished the piece. Please visit the galleries - if you would like to purchase a piece, please contact the artist.